Welcome to the Ink It! Stamp It! Design Team Blog Hop - we hop every month so be sure to pop back and visit us again! Today our theme is the Holiday Catalogue. One of the things that I love about it is that there are so many versatile products and versatility means more use and great value for money! An incredibly quick and easy card to make with the Hearts Come Home stamp set! So, with Christmas trees and Santa in his sleigh, the Hearts Come Home bundle is clearly intended as a Christmas set but is actually good all year. For the first card, I used the sponge brayer to apply Crushed Curry, Pumpkin Pie and Elegant Eggplant ink to a piece of Whisper White cardstock. 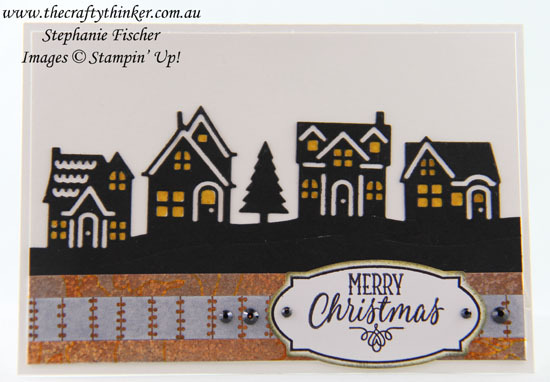 I then stamped with Basic Black Archival ink, added the moon and stars with white heat embossing and sponged below the houses with Basic Black ink. If I'd planned properly (! 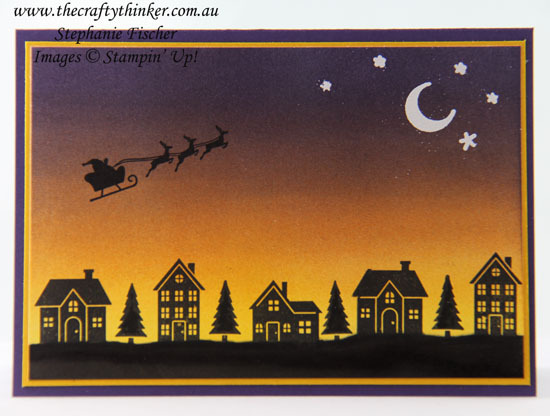 ), I would have clear embossed the moon and stars before I started adding colour. The middle card is also a Christmas card but this time I used the dies from the bundle to cut Basic Black cardstock, glued this to a piece of Whisper White cardstock, added Year of Cheer Washi Tape and a sentiment from Hang Your Stocking cut with the label from the Rose Garden Thinlits, edged with Crushed Curry and Basic Black ink. It needed a bit of bling so I added some Black Rhinestones. 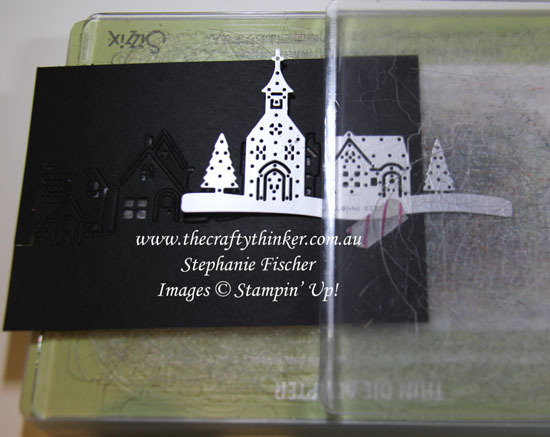 I used Stampin' Write Markers to colour in the windows. Those familiar with the dies may be thinking - but there are only three houses in the row! To add the fourth house, cut with the first die and then place the next die in position (I could feel when the blade of the second die fit in with the cut for the ground left by the first die). To cut the house from the second die, the tree and church had to overlap the houses I'd already cut, so I positioned the top cutting plate in such a way that only the house was covered and, therefore, only the house was cut. To avoid the overlap, you could simply use the same die twice. This last sample is a housewarming card. 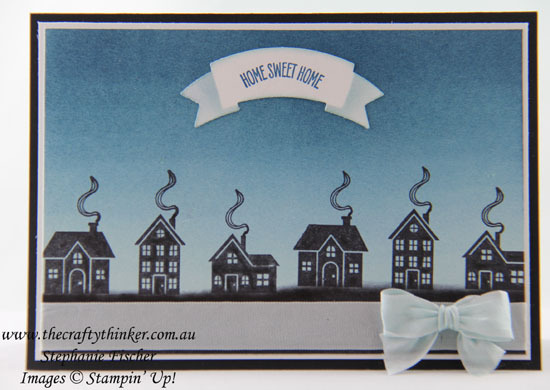 I brayered Dapper Denim to the top part of a piece of Soft Sky cardstock and stamped the houses with Basic Black. Since Santa is nowhere in sight - I added the smoke coming from the chimneys! I sponged the lower part of the card with Basic Black and then added some ribbon and a bow to soften the look a little. This Soft Sky ribbon is, sadly, from my retired stash because I haven't yet purchased the current Soft Sky Classic Weave ribbon. The Hearts Come Home stamp set is good for more than just Christmas! The greeting is from the Sweet Home stamp set and I punched it out with the Duet Banner Punch. I then sponged with Soft Sky ink in the same way as I did for this card. Thank you so much for joining us today. We hope you'll join us again next month for our Technique projects! I'm Stephanie Fischer and to keep hopping around see the list below to see who is up next with another great project .